Judging sound by ear alone stands first among the pleasures of writing for Ultra Audio. Your reporter offers an opinion about how something sounds, and there (for him) the inquiry ends. The science and technology behind his perceptions occupy an ocean into which he need not plunge too deep. My interest in hi-fi dates to the monophonic Pleistocene, and from the outset, my hugely imperfect understanding of what makes audio work has deferred to my ears. Quite simply, for the stone subjectivist listener, home audio exists to serve recordings -- to get said subjectivist closer to the Truth within those cherished squiggles or pits. If what more sober types dismiss as voodoo appears to assist this end, why then, yes, porcelain cable lifters and wooden balls in porcelain saucers are appropriate topics for contemplation. One remains permissive on principle. For this long-in-the-tooth American audiophile, top-flight hi-fi hardware has been, in this order, an affair domestic, British, Continental, and Canadian. Way back when, Asian goods did not recommend themselves to the hobbys high end. Japan, then the worlds leading source of mass-market electronics, has, among audiophiles, long since shed its populist stigma. Indeed, some of the high ends farthest-out practitioners now hail from the Land of the Rising Sun. Nowadays, no sooner have we become comfortable with top-quality Chinese audio than Turkey checks in. These Resonance Absorbing Balls could be from anywhere, whereas the sensuously tapered Cable Lifters bear a trace of their Ottoman heritage. The NonameHifi websites banner includes the motto "kel alaka bir hi-fi sitesi." I dont know what it means, but it has a lovely ring. NonameHifi recommends filling each Cable Lifter ($109/set of six) with sand. For this, you remove a plastic plug at the base. I have a couple hundred pounds of sand -- not for filling speaker stands and such, but more for spreading atop driveway ice. Had the directions called for calcium chloride, Id have complied no less willingly. I live in a boreal wonderland. Its snowing as I write, with frozen rain in the forecast. I use Nordost Valkyrja speaker cables -- stiff, 1.75"-wide ribbons. The top of the Cable Lifter is grooved for tubular cables, but getting the Nordost ribbons to fit the grooves edgewise wasnt much of a chore. The excellent Valkyrjas could as well lie flat atop their little towers -- the idea is to get them off the floor. I thought my wife, an interior designer and therefore a décor fanatic, would blow a fuse on seeing a half-dozen Lifters scattered about the living-room carpet. To the contrary: "Theyre adorable! They look like little people holding the ribbons aloft!" I say Ottoman, she says pixies. A wondrous engine, the beholders eye. Weve been here before . . . I confess -- in the past, Ive parted my speaker cables from the carpet because its what really classy audiophiles do. GutWire NotePads -- pillows filled with a polymer gel -- served the purpose. (The NotePad primarily provides acoustic isolation for A/V hardware.) I never heard a difference, nor did I test for one. This time, it was my job to listen more attentively. The nice thing about reviewing isolation products is the break-in period: There aint none. From the information sheet: "NonameHifi Cable Lifters are designed to improve the performance of good high end audio and video systems. They will particularly reduce bass boom. 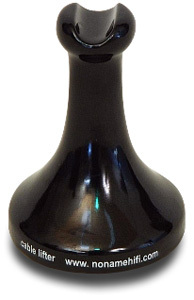 Therefore better articulation of bass, low level details, opening of midrange and treble will be immediately evident." Immediately evident? Not quite. And yet . . . I played a number of recordings in order to detect a difference, and I maybe heard a wee something. But "bass boom" has never been a problem here. The Wilson Audio Specialties WATT/Puppy 8 speaker system isnt what youd call a thumpy product, nor does my listening room produce tubby effects. Among the discs I used to hear a difference is a recent release of three Sinfonias by Carl Ditters von Dittersdorf (1739-1799), performed by the Lisbon Metropolitan Orchestra, Álvaro Cassuto directing [CD, Naxos 8.570198]. Engineer Eleanor Thomasons recording of these attractive, Classical-period works emphasizes a fullish midrange and bass that, under the right conditions, could sound too plummy; ergo, an ideal test disc for the Nonames. I played the first few minutes of track 1 about a dozen times, Lifters in, then Lifters away, listening specifically for those advertised bennies. I wont say they werent there, nor can I claim that they absolutely were. I think I heard something going on that I liked. Within the narrow scope of "maybe," an all-time favorite CD suggested that I was hearing a small but interesting improvement. Yukio Kojima is a brilliant recording engineer. To know more about his ALM label, have a look at www.kojimarokuon.com/encorporation.html. Pianist Aki Takahashis performance on ALM ALCD-33 makes worthwhile the fuss and expense to which we fanatics go. The clearly arrayed harmonic subtleties of Morton Feldmans ever-sedate Triadic Memories, for solo piano (1981), encourage critical listening, particularly with a recording like this, which puts you in close proximity to the pianos particularly rich low end and gorgeously textured midrange. The score calls for lingering decays that, in terms of a test, speak volumes. With the Nordost ribbons up on the Lifters, I thought I heard a slightly less congested image, with the emphasis on slight. Look, this might just be a matter of where my blood went -- the mere act of getting up from the couch and bending over speaker cables could account for the variations in what I heard. Its also been my experience that an impression of a vanishingly small difference soon settles down to sonics-as-usual. I adjust so quickly to infinitesimal changes that, after a time, I can no longer swear theyre there. But then, for the audiophile, maybe is often enticement enough. NonameHifi also sent for review one quartet of Resonance Absorbing Balls ($109/set of four). My systems electronics consist of a pair of NuForce Reference 9 SE monoblock amps and an Integris CDP CD player. On the floor behind the left speaker sits a large Richard Grays Power Company 1200S power-line conditioner, plugged separately into the dedicated duplex outlet the Integris occupies. Having but one components worth of NonameHifi RABs to use, I opted for the Integris. I think we can all agree that analog and digital playback gear is likelier to benefit from, and reveal differences in, acoustic isolation. Be that as it may, because I had but one set of RABs to play with, the CDP was the only logical choice. Each NuForce amp sits on three Golden Sound DH Cones, each pointing downward into a DH Square. The glazed Cones are ceramic, probably porcelain; the Squares are a graphite-based synthetic. The CDP sits on a home-brew rig consisting of four upward-pointing Vibrapod Cones supporting a concrete patio tile, and atop this, as with the amps, three DH Squares, each receiving the point of a DH Cone. As just mentioned, and no surprise, playing the Integris CDP in direct contact with the cabinet introduced a mild degradation in sound quality. The next, presumably easy step: inserting NonameHifis RABs under the Integris. "Presumably"? Cemented to each ceramic saucers underside is a small, spongy, rectangular pad. Perhaps its size and shape are critical to the RABs performance. In terms of stability, a spongy footing the size of the saucer would have been the better choice. The consumer is instructed to manipulate the component until each ball is centered in its saucer. Easier said than done. With the RAB combo under the CDP, the saucers leaned in several directions. Centering the "US made precision [balls of] pendula wood" appeared hopeless, and after about ten minutes I gave up fussing. 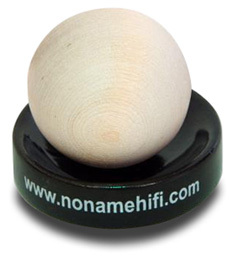 The stability problems of NonameHifis Resonance Absorbing Balls preclude my recommendation. In hope of ending on a more positive note, I gave the Lifters another go. The first and final movements of Mahlers Symphony 7, with the Staatskapelle Berlin under Daniel Barenboims direction [CD, Warner Classics 2564 62963-2], feature profound bass-drum grumbles as well as a large and dramatic image. The Lifters-in, Lifters-out drill conveyed no audible difference. The ALM piano-solo CD worked, at least for me, as a better, if still tentative, demonstration of effectiveness. So there you have it: one maybe, one no thank you. Prices: Cable Lifters, $109 USD/set of six; Resonance Absorbing Balls, $109/set of four.